I'm sure everybody wants to dance to the newfangled pop songs in Dance Central, but I'm psyched for the oldies. The complete track list for Harmonix's Dance Central was announced today. I got to dance a couple of these tracks (Beastie Boys' "Body Movin'" and No Doubt's "Hella Good") at San Diego Comic Con this summer and I'm glad to see they made the cut. But what I'm really excited about is sweating to the oldies like "Brick House" and "Jungle Boogie." Dance Central is a launch title of Microsoft's Kinect which is in stores on November 4th. 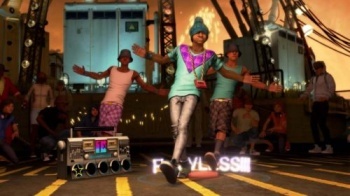 Check out all of the songs that you can shake your bootie to in Dance Central below. I've heard of most of these, but I have to wonder about that first title. Isn't that something most people figure out on their own? Audio Push -- "Teach Me How To Jerk"
Beastie Boys -- "Body Movin' (Fatboy Slim Remix)"
Beenie Man -- "King Of The Dancehall"
Bell Biv DeVoe -- "Poison"
Cascada -- "Evacuate the Dancefloor"
Christina Milian -- "Dip It Low"
The Commodores -- "Brick House"
Craig Mack -- "Flava In Ya Ear (Remix)"
Dirty Vegas -- "Days Go By"
Eric B. & Rakim -- "Don't Sweat the Technique"
Jay Sean ft. Lil Wayne -- "Down"
Kool & The Gang -- "Jungle Boogie"
Kylie Minogue -- "Can't Get You Out of My Head"
Lady Gaga -- "Just Dance"
Lady Gaga -- "Poker Face"
Lipps Inc -- "Funky Town"
Nina Sky -- "Move Ya Body"
No Doubt -- "Hella Good"
Pitbull -- "I Know You Want Me (Calle Ocho)"
Quad City DJ's -- "C'mon N' Ride It (The Train)"
Rihanna -- "Pon de Replay"
Snoop Dogg/Pharrell -- "Drop It Like It's Hot"
Soulja Boy Tell 'Em -- "Crank That (Soulja Boy)"
Technotronic -- "Pump Up the Jam"
Young MC -- "Bust A Move"